Landing pages can get really long, which is totally fine, especially if you use a sticky anchor navigation to scroll people up and down to different page sections. It’s a great conversion experience and should be embraced. However, there are times when having a small multi-page site, known as a microsite (or mini-site) can offer significant advantages. This is not a conversation about your website (which is purely for organic traffic), I’m still talking about creating dedicated marketing-campaign-specific experiences. That’s what landing pages were designed for, and a microsite is very similar. It’s like a landing page in that it’s a standalone, controlled experience, but with a different architecture. 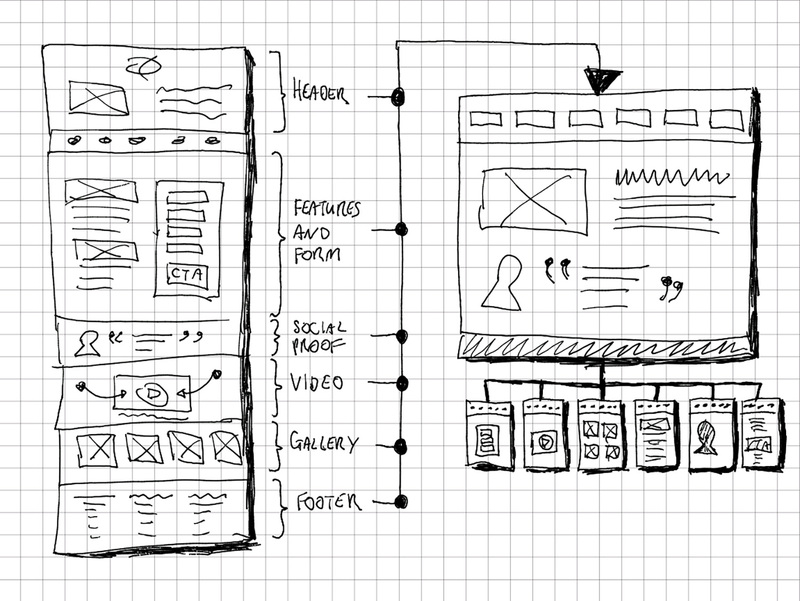 The sketch below shows the difference between a landing page and a microsite. The landing page is a single page with six sections. The microsite has a homepage and 5 or 6 child pages, each with a persistent global navigation to conect the pages. They are both “landing experiences”, just architected differently. I’ve noticed that many higher education landing experiences are four-page microsites. The pharmaceutical industry tends to create microsites for every new product campaign – especially those driven by TV ads. What are the benefits of a microsite over a long landing page? To reiterate, for most marketing campaign use cases, a single landing page – long or short – is your absolute best option. But there are some scenarios where you can really benefit from a microsite. You can add a lot more content to a certain page, without making your landing page a giant. You can get more advanced with your analytics research as there are many different click-pathways within a microsite that aren’t possible to track or design for on a single page. 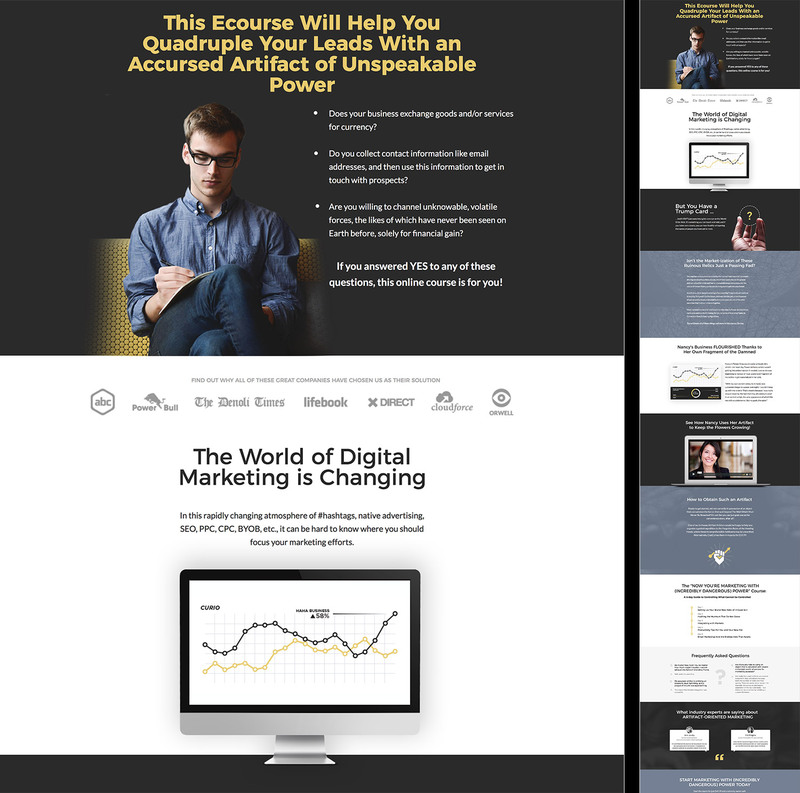 The technique I’m going to show you takes an Unbounce landing page, turns it into a 5-page microsite. The connective tissue of a microsite is the navigation. It links the pages together and defines the available options for a visitor. 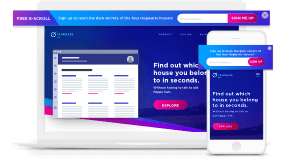 I’ll be using an Unbounce Sticky Bar as the shared global navigation to connect five Unbounce landing pages that we’ll create from the single long landing page. It’s really easy. I’ll explain it in more detail with screenshots and a quick video. Click “Publish” << hardly a step. Choose “Duplicate Page” from the cog menu on your original landing page to create a new page (5 times). Then name each page and set the URL of each accordingly. In the screenshot below you can see I have the original landing page, and five microsite pages Home|About|Features|FAQ|Sign Up. Open each page in the Unbounce builder and click the background of any page section you don’t want and hit delete. It’s really quick. Do this for each page until they only have the content you want to be left in them. Watch the 30 sec video below to see how. There is another way to do it. Instead of deleting sections, you can start with blank pages for the microsite, and copy/paste the sections you want from the landing page into the blank pages. This is one of the least-known and most powerful features of Unbounce. 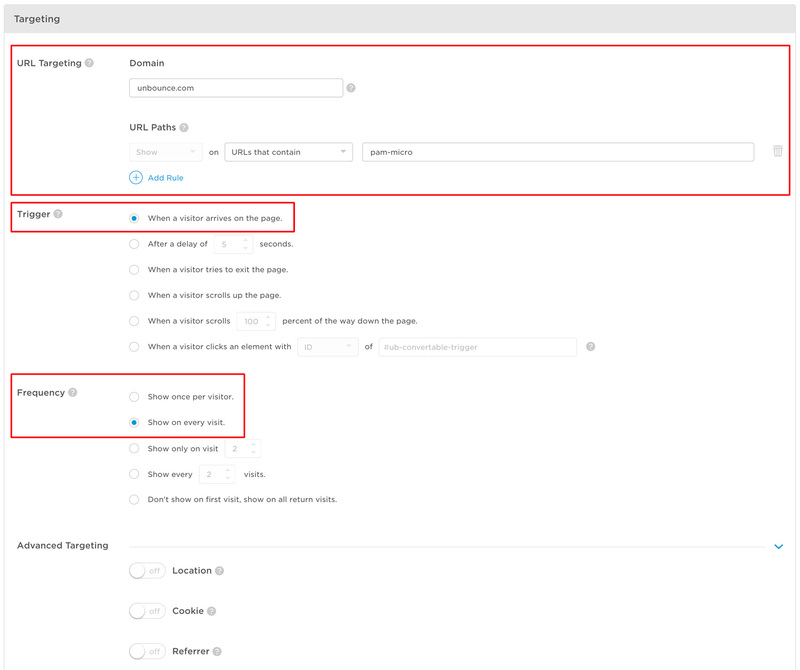 Create a new Sticky Bar in Unbounce (it’s the same builder for landing pages and popups). Add buttons or links for each of your microsite pages, and set the “Target” of the link to be “Parent Frame” as shown in the lower-right of this screenshot. This is where the connective tissue of the shared Sticky Bar comes together. On the Sticky Bar dashboard, you can enter any URLs on your domain that you want the bar to appear on. You can enter them one-by-one if you like, or to make it much faster, just use the same naming convention (unique to this microsite/campaign) on each of the microsite page URLS. For the URL Targeting, I simply set one rule, that URLs need to contain “pmm-micro”. for the frequency, I selected “Show on every visit.” because the nav needs to be there always. Note: As this microsite solution was 100% within Unbounce (Landing Pages and Sticky Bar), you don’t actually have to add the script to your website, you can just add it to the each of the landing pages individually. But it’s best to get it set up on your website, which will show it on your Unbounce landing pages on that domain, by default. As this is a navigation bar, and not a promo, we need to make sure it’s always there and can’t be hidden. It’s not a native feature in the app right now, so you need to add this CSS to each of the microsite pages. You can see the final microsite here. (Desktop only right now I’m afraid. I’ll set up mobile responsive soon but it’s 2am and this blogging schedule is killing me :D). This use of a Sticky Bar isn’t a native feature of Unbounce at this point, it’s just a cool thing you can do. As such, it’s not technically supported, although our community loves this type of thing. As it’s using a shared Sticky Bar for the nav, you’ll see it re-appear on each new page load. Not perfect, but it’s not a big deal and the tradeoff is worth it if the other benefits mentioned earlier work for you. All in all, this type of MacGyvering is great for generating new ways of thinking about your marketing experiences, and how you can guide people to a conversion. I’ve found that thinking about a microsite from a conversion standpoint is a fantastic mental exercise. Have fun making a microsite, and never stop experimenting – and MacGyvering! p.s. Don’t forget to subscribe to the weekly updates for the rest of Product Awareness Month. Popups create focused conversion experiences anywhere on your site. Sticky bars “stick” to the top or bottom of your webpages. Over 90% of website visitors leave without buying. With highly targeted popups and sticky bars, you can trigger relevant offers on any page of your site to convert abandoning visitors. Publish popups and sticky bars in minutes. Drop a single line of code on your website, and you can publish to any page of your site, anytime, without a developer. Advanced targeting, triggers, and testing. Optimize the visitor experience with advanced targeting (URL, referer, cookie, and geo-location), 6 trigger types (entry, exit, delay, on-click, scroll up, and scroll down), as well as frequency settings and built-in A/B testing. Create a high-converting popup or sticky bar today. A real look at lessons learned as we expand from one to many products. We’ll share innovative tips, and demonstrate how you can market your products in ways that really resonate. Why are You Neglecting the Highest-Traffic Lowest-Converting Page on Your Website? Is Content Marketing a Waste of Time and Money? Data and Lessons Learned from 20 posts in 30 days.